Remove and discard outer and bruised petals from roses. Carefully remove rose petals, and gently wash in cool water. Dry petals in salad spinner or by patting dry with paper towels. Set aside 20 petals for garnish. Chop remaining petals. In 4-quart saucepan, mix egg yolks and sugar. Using whisk, beat in whipping cream. Heat almost to boiling over medium heat, stirring constantly. Remove from heat; refrigerate 10 to 15 minutes to cool. Stir in rose water, vanilla and chopped rose petals. Pour into ungreased 11x7-inch baking dish. Cover with plastic wrap; place in freezer about 3 hours or until frozen. Meanwhile, lightly brush both sides of remaining rose petals with pasteurized egg white. Sprinkle with fine sugar, and place on waxed paper. Allow to dry completely, 1 to 2 hours, then use immediately as garnishes on scoops of ice cream. Discard any remaining sugared rose petals. 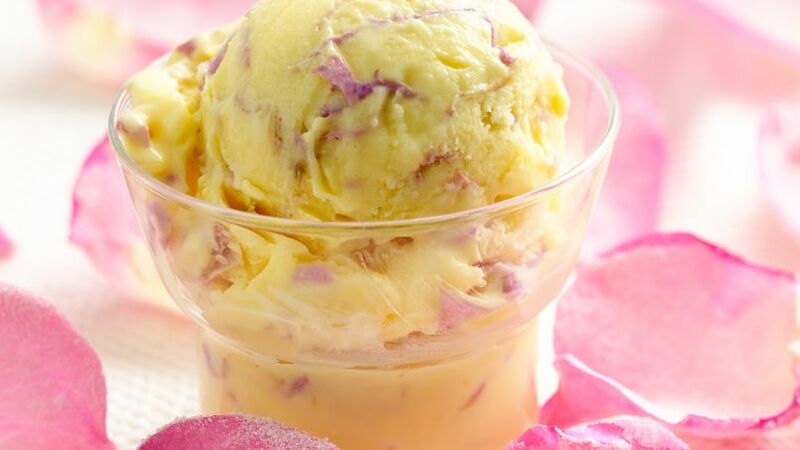 Enjoy the flavor of rose in this delicious ice cream – a perfect frozen dessert.